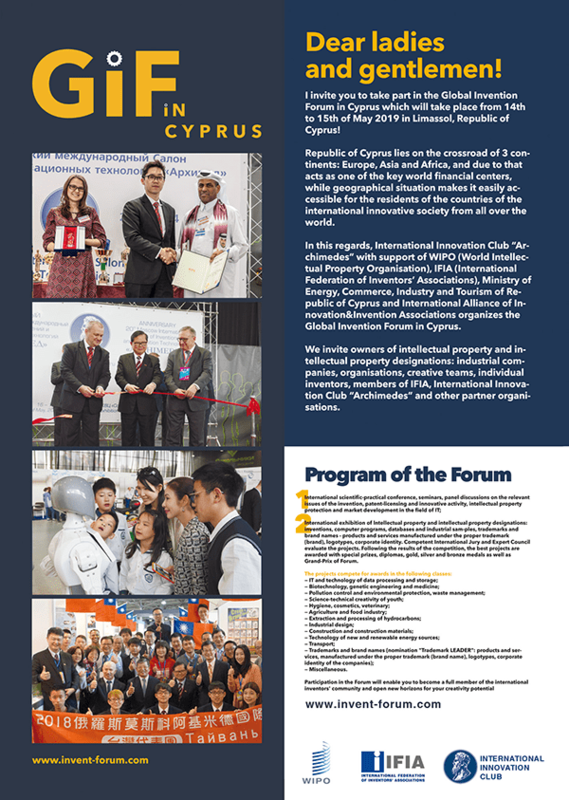 You are invited to take part in the Global Invention Forum in Cyprus which will take place from 14th to 15th of May 2019 in Limassol, Republic of Cyprus! Republic of Cyprus lies on the crossroad of 3 continents: Europe, Asia and Africa, and due to that acts as one of the key world financial centers, while geographical situation makes it easily accessible for the residents of the countries of the international innovative society from all over the world. Nowadays, technologies play the role of the fundamental parameter for the raise of effectiveness and increase of the economic development of the country. Innovative activity based on the new technologies helps to speed up the creation of the new and advanced types of products and services based on the knowledge and intelligence. All these factors change the structure of national economics, no matter what the size of the country is. In particular, Cyprus started to invest into the creation of the new image of the country as innovation state. The country wants to keep the stable position as a reliable investment partner and center of innovative activity. In 2017 Cyprus started to attract the innovative business by giving start-up visas to businessmen whose innovative projects have a big growth potential. Over the last few years many centers of innovations appeared in Cyprus, which assist the creation, growth and development of innovative companies in the region, as well as the cooperation between commercial and research sectors. In these regards, International Innovation Club “Archimedes” with support of WIPO (World Intellectual Property Organisation), IFIA (International Federation of Inventors’ Associations), Ministry of Energy, Commerce, Industry and Tourism of Republic of Cyprus and International Alliance of Innovation & Invention Associations organizes Global Invention Forum in Cyprus. We invite owners of intellectual property and intellectual property designations: industrial companies, organisations, creative teams, individual inventors, members of IFIA, International Innovation Club “Archimedes” and other partner organisations. Participation in Forum will empower you as the members of the world inventors community and open wide horizons for realisation of you potential.